Wine here in Tuscany is part of our traditions, as very first encounter with wine I remember when I was more or less 13 years old; me and my family were dining, my grandfather used to pour from his “fiasco” a splash of red wine into my glass to “fortifie” the water. Professionally I studied at the Hotel and Catering school in Tuscany, I grew up in hotel and restaurant industry, wine has always been present in my life; I am passionate in wine even in other beverages such like beers, spirits, liqueurs; a sommelier must be complete. I don’t have any particular mentors, but I met so many people in the world and in many years, everyone of them gave me something of special. I believe someone should be called sommelier when he works actively in the restaurant industry and acquires during his experience a high level of knowledge and competence. Be a Sommelier or Chef Sommelier means be a complete character who plays important rôle inside the restaurant, he doesn’t only take care about the wine service but he is responsible of all the beverages from the selection to the sale; he entirely builds the wine list for example. I think knowledge is the “key”, keep on studying and updating about this world, even tasting is important, never alone but with every person who loves the wine, colleagues, sommeliers, winemakers and so on; wine is sharing. Also it is important know the factor “terroir” where the wine comes from; therefore travelling a lot, visiting wineries, speaking with winemakers reveals itself necessary to build the sommelier’s professional background. Last thing but not the least important is today every sommelier should be a good manager. How to improve the restaurant income, up-selling wine and at the same time satisfy guest needs or expectations is fundamental. Giuseppe Vaccarini, best sommelier of the world in 1978, is the person who I admire, he dedicated his life to the professional sommellerie; I studied on his books, practically He founded all the Italian Sommellerie. Studying a lot, tasting, have a open mind, work with great professionals possibly in great “maison”, multicultural environment where the attention to the guest and details can make really the difference; travel, learn the main foreign languages and traditions. It’s really important have lots of motivation, the same which let you reach yours goals. It depends on many factors: personally I never impose my personal advice or taste to my guest, I don’t choose for myself but for him and I try to lead him depending on his personal flavour and what he eats; I try to understand what he likes and doesn’t like even if a single wine can’t match for a whole dinner, specially with a tasting menù composed by 6-7 courses for example. A good restaurant should have a nice selection of wine glasses even for spirits and beers, the right glass enhances the wine character; Riedel is a brand I love, specially for design, handling and technical characteristic. Talking about a gastronomic restaurant for example I believe that a guest would or should make a complete gastronomic experience. Every dish offer us a different texture as well as different gustatory and tactile sensation; for this reason, wine pairing reveals itself extremely important in terms of income and guest satisfaction. Therefore when a guest choose a tasting menú composed by many courses I usually suggest a wine pairing by the glass, a wine trail composed by different sips that can fit very well with food; this gives the opportunity to taste not only one but different kinds of wines during a meal. Wine trip could be a pleasant discover and extremely with a good value; guest satisfaction usually is very high. It depends on restaurant policy; some of them don’t permit to taste the guest’s wine and the rules should be respected. I usually smell the wine, but sometimes I need to taste it because I want to be sure about its cleanness and probably the guest will ask me something about that wine. Chef builds and puts his name on the menù, Head Sommelier builds and and put his name on the wine list which depends on the restaurant’s budget; build a cellar with a good selection of wines, famous vintages and rarities could cost lots of money and time and someone could see this as a cost and not as an opportunity of a good investment for the future. It depends on the level of restaurant, but generally the right markup should be in proportion to wine’s cost, more cost the wine and less should be the markup in proportion; even decide which wine goes by the glass and which not, broadly speaking the relationship with supplier is extremely important. I hate mark-ups too high, people are not stupid and I want to let my cellar rotate; for example if I would apply mark-ups too high I couldn’t sell wine by the glass as I usually do. In those cases of a wine very rare, few bottles produced, very hard to get, an exceptional vintage; I would apply an high mark-up because of its exceptional quality: it’s a market’s law. The right cellar management, good pricing and up-selling policies can rise the income and determine the success of a restaurant. Who is in charge of the cellar should be a good manager before to be a great sommelier. If not you will get fired very soon. How do you manage to stay on top of the changes in the wine industry? 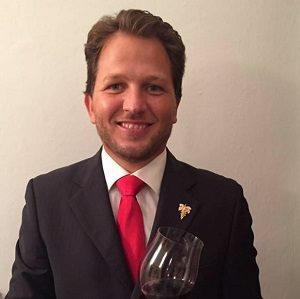 Studying a lot, reading wine magazines and website, participating to wine seminars, wine exhibitions, tasting with the people; two month ago I won the national contest as “best sommelier of Italy ASPI 2015”; this makes me very happy and proud, but I worked very hard in the last 6 months to reach this goal; I kept on studying 3/4 hours a day, sometimes more. In the next future I would like to become Master Sommelier (Court of Master Sommelier), a study path that it will not be easy and to have the possibility to partecipate to the international contests “Best Sommelier of Europe” and “Best Sommelier of the World” organized by Association de la Sommellerie Internationale, the only one which comprehends 60 countries in the world. I would be a Barolo because of his chameleon personality, it’s capable to synthesize more than many other wines, the terroir where it comes from. He needs time to moderate its roughness but when it is mature, it reach its maximum expression, it’s really great. Generally I love those wines very traditional which communicate us the essence of terroir. As home wine collection I would prefer Barolo very traditional style, Chianti Classico very traditional style, Champagne, even German Riesling if I could add one type. Instead If I would be on a desert Island, I guess very hot I would quench my thirst with Clos de Mesnil from Maison Krug. As platform many, for example I would suggest you guildsomm.com, moselfinewines.com, winehog.org, As magazines I usually read Italian magazines Spirito Divino and Civiltá del bere.